Lacking a decent keyboard for password entry, it’s tricky to secure a wearable computer so that someone else can’t just put it on and access your private files. But researchers have come up with a better alternative, by listening to the unique sound of the wearer’s skull. That’s not to say that your brain is emitting an imperceptible hum all the time. 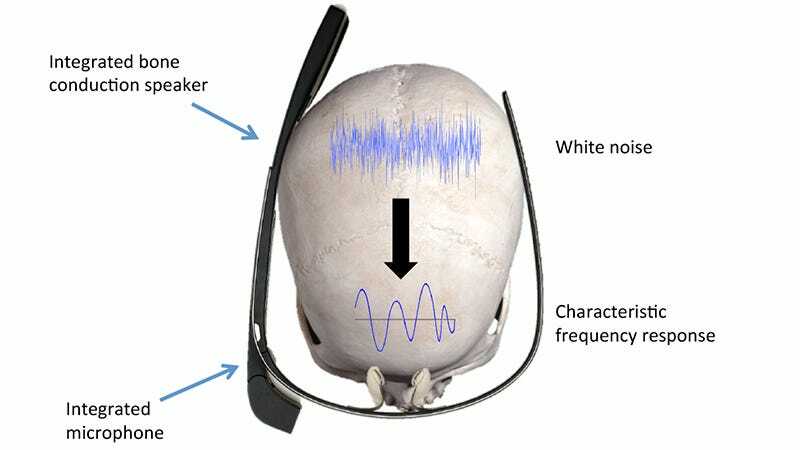 Instead, wearable computers like Google Glass or VR goggles would use an integrated bone conduction speaker to blast an ultrasonic signal into the wearer’s skull. A microphone on the device would then record exactly how that signal sounded after bouncing around inside someone’s head, and the unique results could then be used to authenticate an approved user. The unique approach to biometric authentication was created by a team of researchers from the University of Stuttgart, Saarland University, and the Max Planck Institute for Informatics, all based in Germany. In a controlled experiment using 10 different participants who were free to take them on and off as they pleased, the devices were able to accurately recognize their assigned owners 97 percent of the time.